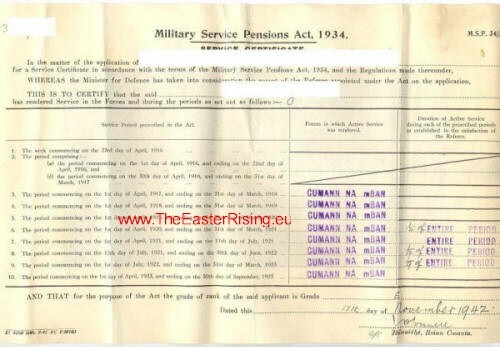 Any person who rendered active service in Oglaigh na hÉireann or a kindred organisation during the week commencing 23 April (Easter Week), 1916 was eligible to be awarded a certificate of service and a military service pension under the Military Service Pensions Acts 1924. All such persons were later also eligible for the award of the 1916 Medal which was instituted in 1941. 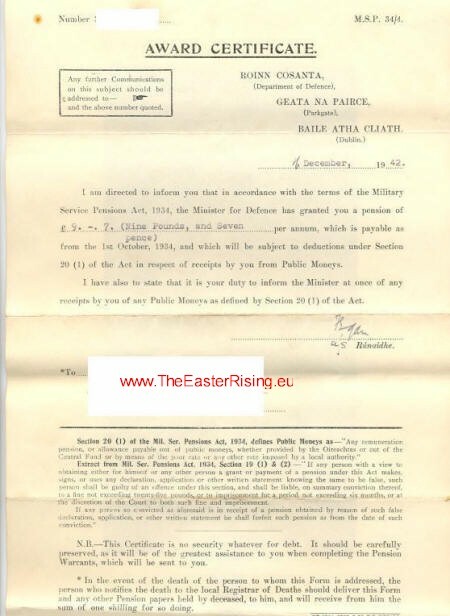 The Minister for defence recommended the issue of a medal with bar to all persons awarded service under the Military Service Pensions Acts and those who did not apply for a pension but who satisfy the Minister that they rendered service between 1916 and 1921 and a medal without bar to all those enrolled the IRA, Fianna Eireann, Cumann na mBann and the Irish Citizen Army not less than three months prior to 11th July 1921 but who did not qualify for a pension. 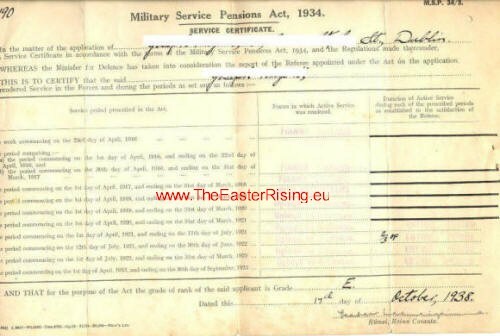 To qualify for a pension an applicant must show that he had military service subsequent to the 1st July, 1922, as well as service in Easter Week or throughout either of the periods 1st April, 1920, to the 31st March, 1921, or from the 1st April, 1921, to 11th July, 1921. 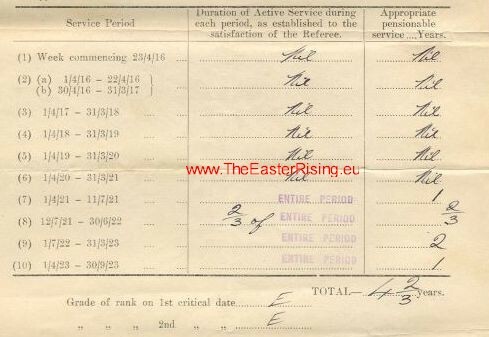 Applicants who secure a service certificate will be awarded a pension on the basis of their rank on the 11th July, 1921, or on the 1st July, 1922, whichever is the higher. Pension file application and determination of Mr. J-- N---. The text of the example on the right is shown below. 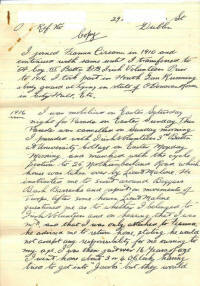 This was then converted to a monetary amount to be paid in the form of a pension. Pension file application and determination of Mrs. A------- N------ the wife of the above applicant.